When you’re outdoors, you still want as much privacy as possible when doing your washing and toilet activities. Here are some of the best camping privacy tents out there and a brief guide on how to pick one. If you are looking for a simple pop-up privacy tent, our top choice is the Wolfwise Privacy Tent, if you are looking for a larger tent we recommend the 2-room privacy ten from Ozark Trail. Continue reading for other top picks. The great outdoors is a great place to spend a vacation. The problem is that it can be a bit revealing to do your private business when you’re out in the wild. This is why you’ll want the best privacy tent or shelter for a portable shower, a camping toilet, or an outdoor changing room. Why get a privacy tent? What to look for in a camping privacy tent? One type of privacy tent that is popular is the single-man instant pop-up tents. These tents are really easy to set up and are for a single occupant. Here are two of the best. The Wolfwise Privacy Tent impresses with what it can do for those who use it. As the biggest 1-man privacy tent, it should allow you to do your business without any problems. At more than 6’ in height and an inside area measuring 47” by 47”, you have room to move around. 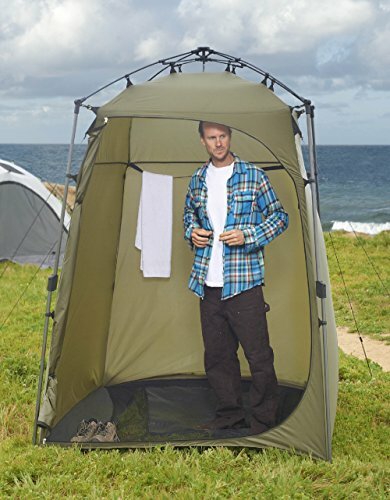 Unless you’re really tall, this privacy tent will be comfortable enough for you at full height. Besides being big, it also happens to be very light with a total weight is around 4.4 lbs. That is pretty lightweight considering the size of the tent. When it is fully set up, you’re going to need to peg it to the ground so that it won’t fly away when the weather is windy. The tent is made of high-quality waterproof nylon polyester. Though it isn’t fireproof, it is coated against UV light, which makes it an excellent emergency shelter when necessary. It helps that the tent only takes a few seconds to set up and take down. It will take you 15 seconds to set it up, while tear down will take double that amount. Besides this easy setup, you can also depend on being able to hang clothes and a detachable roof for an extra window. The real kicker is the removable floor. Take away the floor and dig a latrine and you can have an excellent toilet. All of these are available at a fair enough price. I can honestly say that you’re getting a lot for what you’re paying for. The AW portable changing room is pretty much like the Leapair model, though it is noticeably lower in quality. It has similar dimensions to the Wolfwise, though it may be a bit smaller. However, it is still spacious enough for you to do your business. It weighs around 4 lbs. It has its own carry-bag so it should be easy enough to carry around. One of my concerns about this particular product is the material. It is decently waterproof; the fabric feels a bit cheap. The inside is a basic silver, while the camouflage design outside can be a bit off-putting for those who want something more low-key. Setup is pretty easy. Like all pop-up tents, you just fold it out and it should be ready to go in less than a minute. You can expect to spend a bit more time folding it in, but it should be easy. As for features, it does have a couple of windows you can zipper open and several ropes and pegs to keep it anchored when it is being particularly windy. That’s a good thing since the lightness and the self-supporting nature of the tent really make it easy to go down during a strong wind. I’m actually pretty satisfied with the price. It’s pretty cheap and you definitely get your money’s worth. The other type of privacy tent available can accommodate larger groups of two or more people. If you’ve got a large group going camping, this may be the answer to your needs. 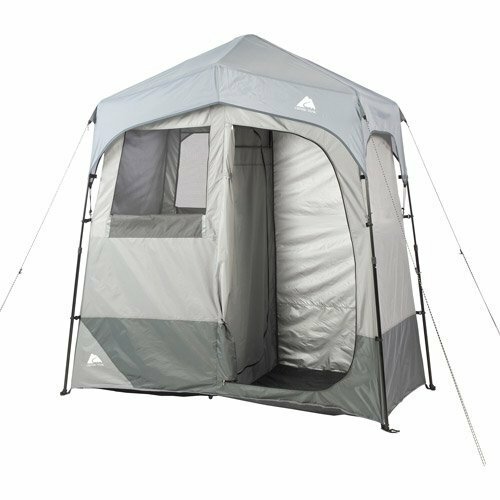 The Lightspeed Outdoors Xtra Wide is a square tent that is 5’ x 5’, this privacy tent does make up for it by providing a rather high ceiling for the people who use it. When folded down, it becomes a square 3’ wide and 6’ tall. Weighing around 16 lbs., you won’t be lugging this around on your back; you’re going to need a car for this one. The weight does indicate one thing: The materials of this tent are pretty solid. The fiberglass poles are supported by more sturdy steel poles. Plus, the polyester material is rated to stand against the rain. Even the removable floor mat is pretty waterproof which can be useful when you want to take a bath inside. Setup and takedown of the tent is actually pretty easy for this tent. All of the poles are in one simple package and you just need to spread them out and attach them to the ten. You can be done in a matter of minutes. There are even tent stakes to further secure this tent to the ground. 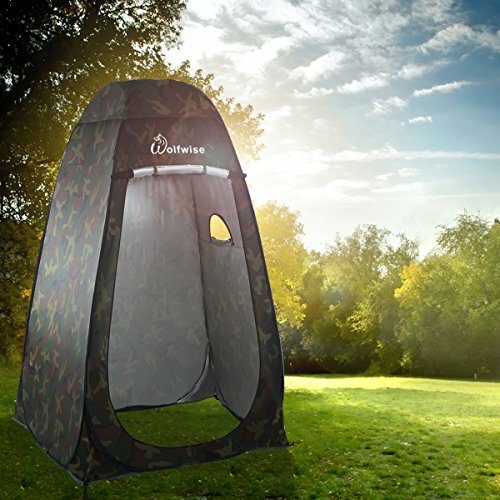 This tent has the basic features that you would expect from the one-man pop-up tents: clothesline, item pouch, removable mat, and mesh windows for when you need to look out. However, considering the price, you are getting more than your money’s worth. This 2-room privacy ten from Ozark Trail scores high marks with me. It may not seem much with its narrow design, but it will meet all of your privacy needs when it comes to showering, changing, and toileting. The best feature was to include a solar shower with the tent! First, let’s talk about size. This particular tent is pretty tall at around 7’ in height. What’s really surprising about this is the 7’ by 3’ size of the private tent. The narrow side is balanced by the wide one. The result is that you get space enough that you can have 2 people in separate compartments doing their own thing. When folded up, it is rather heavy though, and you’re going to need help carrying it around. The tent’s material is solid polyester, while the poles are solid which will support the tent with ease. The tent’s silver aluminum color ensures total privacy along with solid waterproofing. 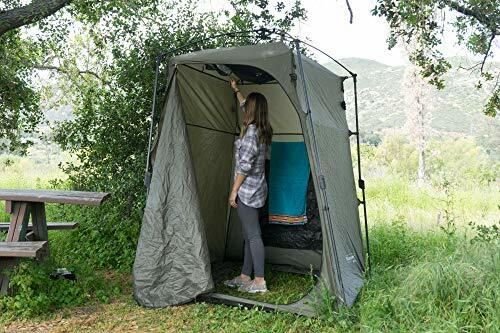 As for setup and take down, this tent is easy to set up though you can do it faster with some assistance, you can have this up and ready for a shower or quick change in a matter of minutes. Taking down is all just a matter of folding up the poles. Where this tent particularly shines is the features that it has. Though it has the normal set of privacy and cleaning features like clotheslines and removable floor, the real winner is the solar shower. You can have a hot shower by loading up a 5-gallon bag of water and hanging it by the roof. In just a few minutes, you can have a decent hot shower. This product is more than worth its price point, and I can say that you get a bargain for what you. Getting the 5 gallons of water for the solar shower can be a challenge. 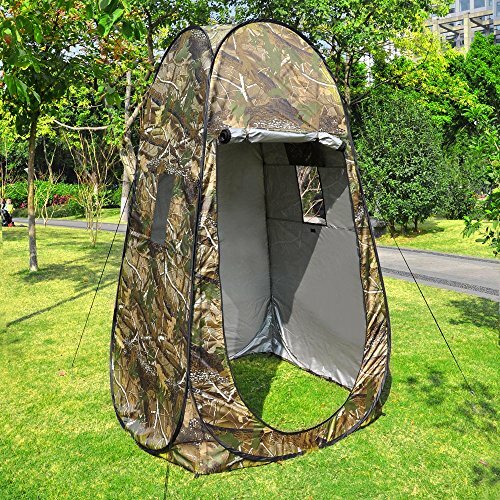 Another dependable privacy tent for camping purposes, this shelter from Texsport impresses with its size and price. Measuring 7’ and height and a 4.5’ by 4.5’ in the interior, it should provide space equal to a small bathroom. The tent weighs around 20 pounds, which can be a bit of a challenge to carry around. Fortunately, the carrying bag makes it a lot easier. The basic tent is made of solid polyurethane fabric, with the steel poles being chain-corded and rust resistant. However, it can be a bit hit-or-miss about the quality of the product. Some of them are pretty good, while others have noticeable defects like rips and more. I’d advise checking the tent out before buying it. As for using it, this is a pretty nice working privacy tent. Though it is pretty spacious, I would recommend only one person use this at a time; it can be a tight fit otherwise. It has all the standard features that you would expect like a removable mat so that you can dig a latrine and a removable rainfly to stop the rain from coming in. The real jewel in the crown is the solar shower. This alone should be worth the purchase price. Overall, you can get your money’s worth from this product. 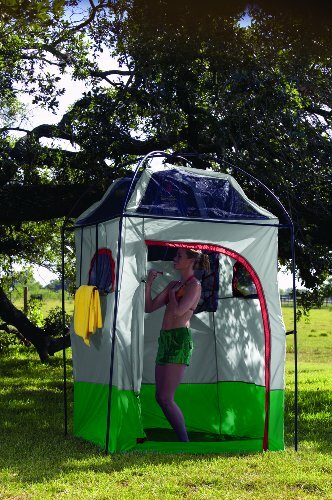 The Northwest Double Shower Tent should remind you a bit of the Ozark Trail tent. They have nearly the same dimensions, after all. Standing at more than 7’, it has a width of around 3.5’ and a 7’ length. You can divide the inner area with a nylon divider, which allows you to have two separate areas. A lot of people prefer to use one area for setting up their porta-potty or latrine by removing the nylon flooring, while the second area accommodates the bathing/shower/changing area. When packed up, it weighs around 16 lbs. and is still rather big. Fortunately, the carrying bag is easy to hold and should be no problem to carry around. This is especially so if you’re traveling with a camper. As for the materials, the nylon fabric looks actually pretty sturdy. It’s pretty opaque so that you can get maximum privacy, while also presenting a certain level of waterproofing. However, the poles are a bit thin and you need to be careful unless you want to end up replacing them. Setup should take around 10 minutes alone, while take-down time is just as long. Overall, for the price you pay, you get a decent privacy tent. It has only the standard features though. The big question that a lot of people ask is whether a privacy tent is worth the hassle of buying, carrying, and setting up. It is definitely worth it for you to take one on all of your camping trips, and here are some reasons why. First, you will want one for privacy. When you’re out in the outdoors, there are no four walls to protect you from prying eyes. It can be very embarrassing to perform your toilet duties with an audience looking on; even if it is just animals, it can be very disturbing. It is also a big help if you’re not alone on your camping trip. Whether it’s with friends or family, they don’t need to witness your shower in the open air. A privacy tent ensures that anything that needs to be private can stay private. Second, it is a lot more comfortable to have one. If you’ve ever gone camping, you may have experienced the problem of where you are going to dress. Camping tents are notoriously cramped for space. This is especially so if you share it with other people. Using it as a changing room will disturb others while they’re still asleep, or maybe make a mess of what’s inside. It is also nicer to do toilet duties while you’re not exposed to the open air. Some people may like to experience that while they’re camping, but if you’re camping for enjoyment then there are some things about the great outdoors you’d probably want to skip. Third, you can be a lot more healthy and safer when you use one. There are a lot of dangers out there in the wild. Most of them can be avoided by having a private tent keep them away. For example, animals and insects can cause trouble for you at the most awkward moments if they were not kept away by a privacy tent. A privacy tent can also keep you healthy by providing a separate space for your waste to go to. Setting it up somewhere away from your camp is already big help in terms of sanitation. As a private toilet, they can contain most of your waste and dirt from your toileting. Overall, your camping experience can positively improve by adding one to your supplies. However, you just can’t buy any tent and use that as your privacy tent. There are several factors that should influence your purchase of a privacy tent. You’ll need to weigh these factors well to make sure that you won’t experience any buyer’s regret quickly after. Here are some of them. The size of the privacy tent is a big factor when you’re buying one. You need one that is tall enough to handle you standing. 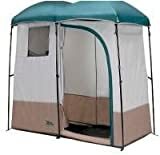 Since this is a general-purpose privacy tent, then it needs to accommodate you in whatever position, seated or standing. Note also that some privacy tents can accommodate more than one person. If you’re camping with your family, that might be more the thing for you. The size of the privacy tent is also related to its weight. Remember that the privacy tent has to be carried by someone. You’ll want a fairly lightweight privacy tent so that you can effortlessly carry it around. Most tents are light enough to do so, but remember that you will be carrying it alongside your normal tent, so it’s best if you choose a tent that isn’t too heavy. Next, you’re going to have to think about are the materials that go into making the tent. Most tent materials are simple polyester cloth, however, some of them are specially treated to be resistant to the elements and UV light. Depending on how long you plan to stay on the trail, you’ll want a tent that has material that will be able to handle the punishment. You may also want to check on whether it has special attributes like whether it is fire retardant or waterproof. The next factor for privacy tents is how they are set up and taken down. Some tents are pretty much just pop-up affairs; you can have them up in a few minutes if you’re experienced. However, other tents have other requirements. You may want to try out a tent at the store to see how it works in action. Besides the basic fact that it provides privacy, you’ll also want to check for extra features that are unique to privacy tents. For example, some tents provide clotheslines and storage bags for personal belongings. One of the really important features you’ll really want is the ability to remove the flooring. This is important if you want to use it as a latrine or a personal bathing area. Finally, there’s the matter of the price of the privacy tent. Most privacy tents range in price from less than a $100 to higher than that. It’s not going to break your budget, but that’s a significant amount of money still the same. However, remember that you get what you pay for. Some tents can be too cheap and result in being shoddy. You’ll want to find a good balance between price and quality. Weighing all of these factors together can make it easier for you to make the right choice when it comes to the privacy tent you should buy. If you want to know more about available privacy tents, here are some reviews of the best available products. Adding a shelter to this camping set up would provide more privacy. Overall, though all of these tents serve their purposes pretty well, two really stand out. For instant pop-up tents, I’d recommend the Wolfewise model. Excellently designed and very convenient, it hits all the right spots for privacy tents. For those who need something bigger, The Ozark Trail model is what I’d consider the best among the bunch. Both are well-design and made of the best materials. Plus, they are both pretty affordable and deliver a lot of bang for their buck.